Range of modes including Smart VW, Temperature Control, Bypass, CCW & CCT. Highly customisable and including all you need to get started with a powerful sub ohm vaping experience, the Tarot Nano Kit incorporates some of the newest technologies Vaporesso has to offer. The Tarot Nano Mod and Veco Tank are perfect partners and ensure you can start chasing massive clouds, enjoy intense and smooth vaping and all in a package which is easily held in the hand. Enjoy up to 80W of power output or customise your setup down to as low as 5W. With OMNI board technology from Vaporesso you can closely tailor your vaping experience exactly to your preferences. Reliable performance with additional scientific focus allows you to create a fully customised vape and an experience which allows both new and experienced vapers to enjoy the same level of tailored experience. The Tarot Nano has a range of modes, including temperature control (280F-600F), Smart VW, Custom Curve Wattage, Custom Curve Temperature and Bypass. Always be up to date with the Vaporesso Tarot Nano Kit as its USB compatibility ensures you can update to the latest firmware, for as long as Vaporesso produce and support it. The Tarot Nano is cast in a combination of zinc alloy, aluminium alloy and carbon fibre for a strong and ergonomic finish and it is teamed with the Veco Tank to finish the box mod kit. With a 2ml e-liquid capacity it provides easily enough space for more than a day’s worth of liquid. Top fill and top airflow design as well as a EUC coil system for both ceramic and traditional cotton choices, the tank offers a further opportunity to customise your box mod kit. It also benefits from being truly leak proof for mess free e-liquid top ups. 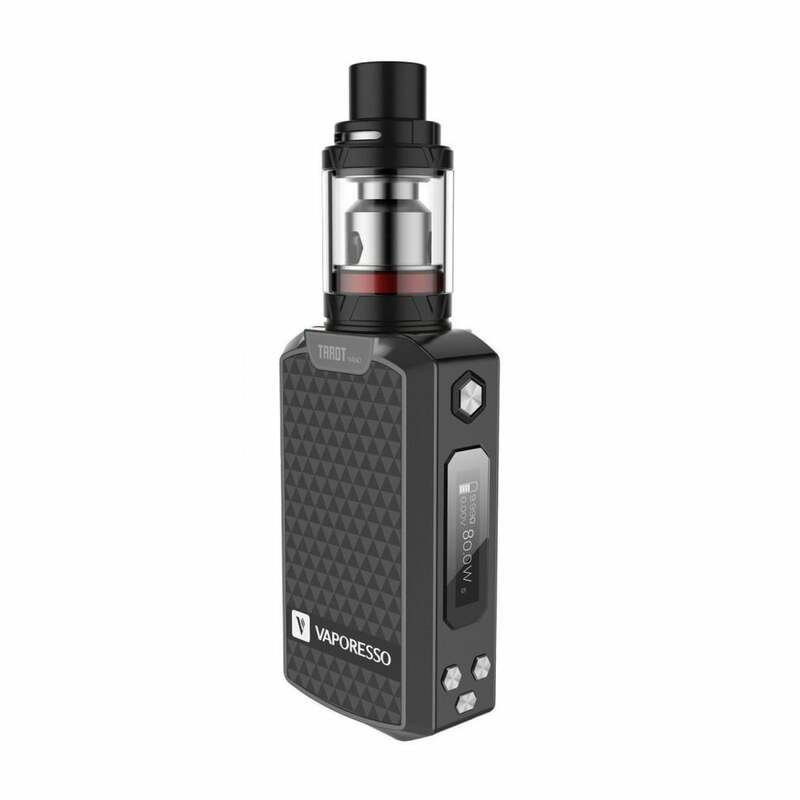 The latest Vaporesso technology and their robust yet style-conscious approach to design ensures the Tarot Nano Box Mod Kit does not disappoint. It is a great choice for anyone who wants ultimate control over their vaping experience and it also ensures that you to choose the colour to suit your preferences and personality. Great product, small yet powerful easy to use and a perfect fit on your hand. As a vaper of many years and someone who has had many many mods I have to say this little piece of kit is brilliant. The smart setting it uses is prefect at setting the temp and wattage every time so no need to mess about. The coils last an extortionate amount of time and the battery is second to none, I'm a heavy vaper and it remains live all day. With the size of it as well you can pop it in a pocket without it looking like to stashed a brick down them and the best part is it doesn't leak like most as the airflow is adjusted at the top not the bottom. Perfect in every way and the plumage is bang on the money. Don't waste your time getting leaked on, confused by multiple setting, a flat battery within 3 hours and a brick size mod...get this one! Great product, easy to use after reading the included manual and experimenting with settings, I am loving the Temperature Control mode for a really customisable vape, also with over 600 puffs on the same 0.5-ohm coil for the included tank, this kit is great value! Excellent bit of kit. Easy to use and great flavour and vapour. Amazing mod! exactly what I needed. Very portable with a fair battery! LIKE! Settings are something you need to you tube if you are nun like me. Once you have your opinion set, vape away.